We went to Tulley’s Halloween theme, it was nightmarish, but such a scream. There was a speech at the very start, these horrors were not for the faint heart. The living dead were roaming all around, leaping and dancing upon the ground. A circus act with an eerie flair, and creepy clowns, with a haunting stare. With ghouls and ghosts and scary bats along with witches, spiders, and horrible cats. 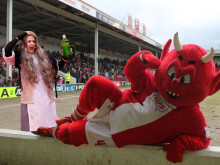 Headless bodies and bits of gory flesh and the weirdest people in fancy dress. One minute you’re being squashed from both sides then out leaps a ghoul from where it hides. You don’t have a clue when they are near, you laugh, you scream so much with fear. Blood thirsty vampires were a scary sight, and ghostly skulls were such a fright. The thing that was extremely nerve racking was the horrible sound of the chain saw hacking. It was so so scary I cannot lie, and why I went I know not why. But all in all it was a massive hit and hundreds are paying to see it. 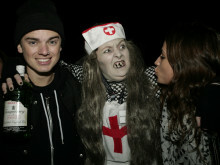 So if your one that likes to be scared witless, then Tulleys should be on your hit list!